This is the official web site for the Police Association of the City of Mount Vernon, NY. 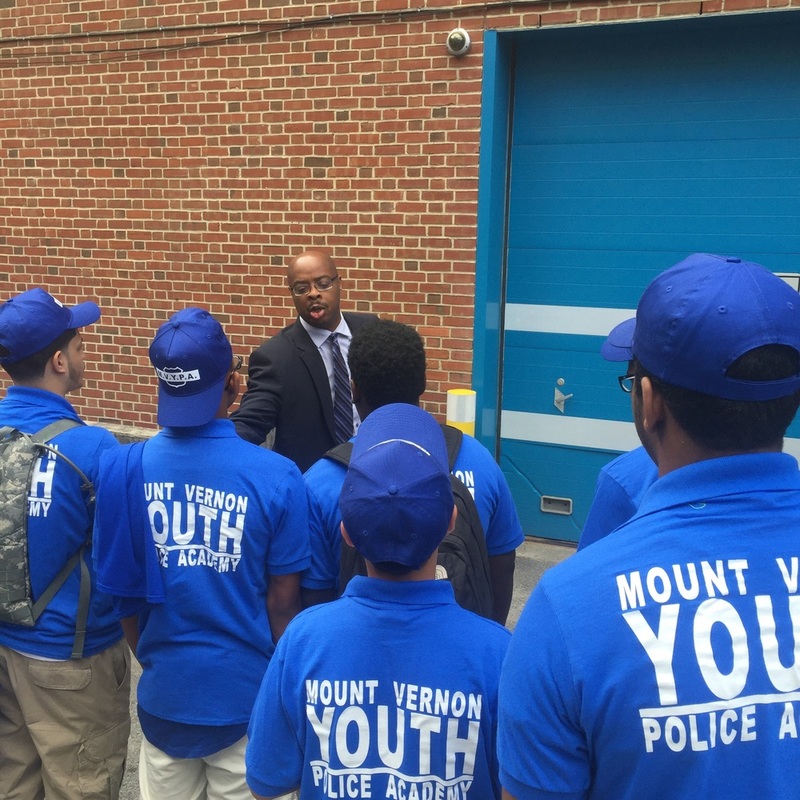 The role of the Mount Vernon Police Association is to support the social, economic, mental and physical well being of its Members. We represent every Uniformed Member of the Mount Vernon, NY Police Department, from the Probationary Police Officer to the Chief of Police. Welcome. The PBA was pleased to be a part of the City of Mount Vernon’s Pumpkin Carving Event and made sure that everyone was fed. We look forward to being a part of the Pumpkin Blaze next week!! The event is on Friday, November 16th at 6 PM. The Westchester County Board of Legislators will vote on the construction of a permanent memorial for Detective Christopher A. Ridley on Monday, July 16, 2018 at 7:00 p.m. This 23 year old Mount Vernon Police Officer was shot and killed on January 25, 2008 by Westchester County Police Officers after being mistaken for a suspect in White Plains, New York. Officer Ridley was off duty when he intervened to prevent serious injury to a resident after observing a violent physical altercation between two men in White Plains. The memorial for this fallen hero will be constructed at the County Office building at 85 Court Street where Detective Ridley was fatally shot. The meeting is on Monday, July 16, 2018 at 7:00 pm at 148 Martine Avenue, 8th Floor, White Plains. Please join us to show your support for Detective Ridley. Today we had 5 Members graduate from a 5 month long Emergency Services Unit School that was hosted by the Yonkers Police Department. Congratulations to not only POs Leonti, Chery, Paulson, Rizzo and Romeo, but to all the other graduates of the School. We appreciate your dedication. Today, Tuesday, May 15, 2018, marks the day that the City Of Mount Vernon will honor not only those Officers that have performed valiantly over the last year and have received awards, but will also remember the four Mount Vernon Police Department Officers that have paid the ultimate price and have died in the Line of Duty. We would be honored if you could attend the Awards and Memorial Service at City Hall at 1030 AM today. This is a part of 2018 National Police Week. Commissioner Ronnie Fatigate (and former Mount Vernon Police Association President) is currently undergoing treatment for a form of Leukemia. While he is getting treatment, his medical bills continue to grow at an astonishing rate. 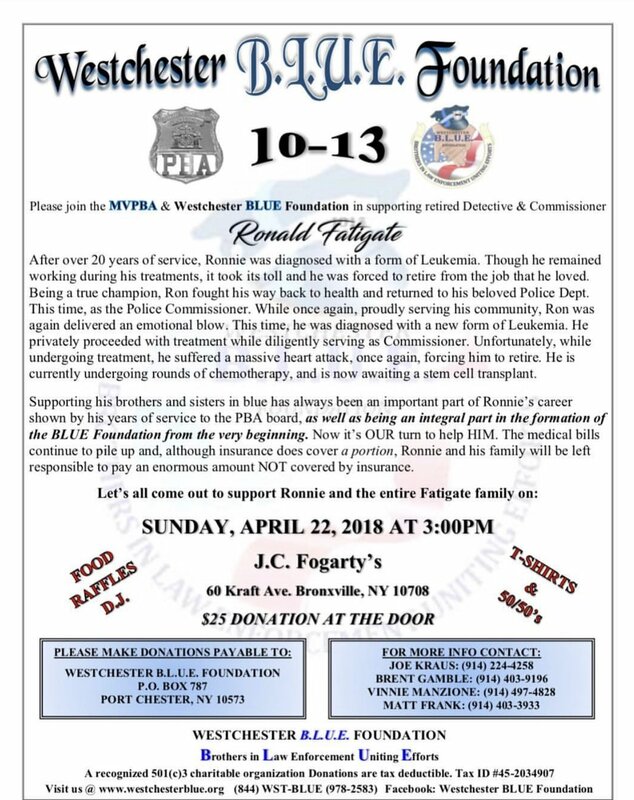 Because of this, the Mount Vernon Police Association, along with Westchester B.L.U.E Foundation will be co-sponsoring a ‘10-13’ fundraiser at J.C. Fogarty’s on Sunday, April 22nd at 1500 hours. Please share this post, it’s time to give back to someone who truly has cared for his community for many years. We encourage every one that supports law enforcement to make a donation to the Police Unity Tour Chapter 37’s fundraiser, a fundraiser that will raise money for expenses related to the Bike Ride that the Police Unity Tour does every year to Washington, DC for Police Memorial Week. 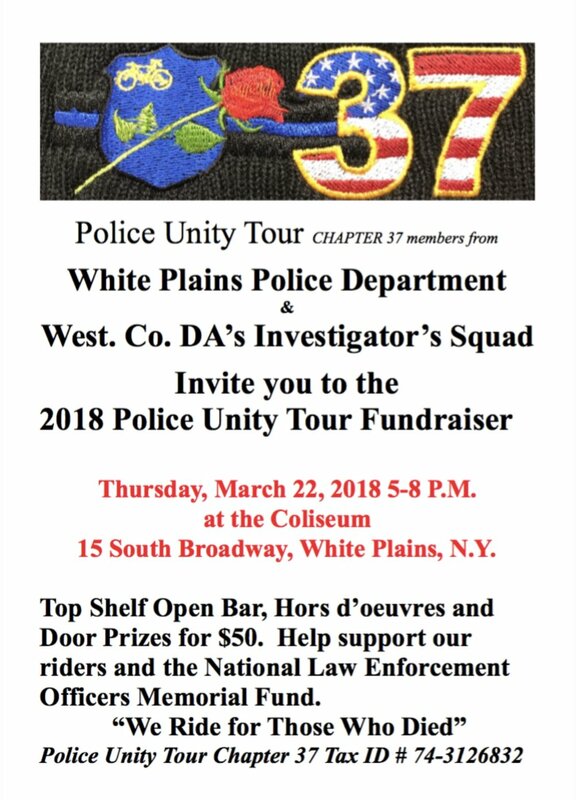 The event is Thursday, March 22 at the Coliseum in White Plains. Congrats to our most Recent Promotees!! Congratulations to our newest Members who were promoted; Lieutenant Jose Quinoy, Sergeants Aristotle Evans and Wendell Griffin, Detectives Natasha Cheron, Allen Patterson and Jose Centeno. We also welcome Police Officer Patterson, a lateral transfer. We want to congratulate our 15 newest recruits, who were just sworn in today by Mayor Richard Thomas. They will be attending the Westchester County Police Academy starting on Monday, where over the next twenty weeks they will gain the basic knowledge to become a police officer prior to coming back to Mount Vernon for an additional few months of training. Congratulations!!! On Friday, November 17, the Association held its Annual Retirement Dinner. We want to congratulate Chief James Dumser, Captain Edward Adinaro, Lieutenant Brian Kennedy, Officer Eugene Wilsea, Officer Raymond Rosado and Officer Arlett Lee not only on their retirement but thank them for their dedicated service to the City Of Mount Vernon. Many happy returns to future Retirement Dinners, Class Of 2017!! Members of the Association had an awesome time participating in the City Of Mount Vernon’s Annual Pumpkin Carvers event, which was held inside of Hartley Park today. We look forward to the Pumpkin Blaze that will be held next week. The Police Association, along with the PDC Foundation, the National Breast Cancer Foundation and My Sisters Place, will be co-hosting the filling events on October 14thand 15th at Tina’s Cucina and Apricots and Honey, respectively. Please stop by and support great causes. 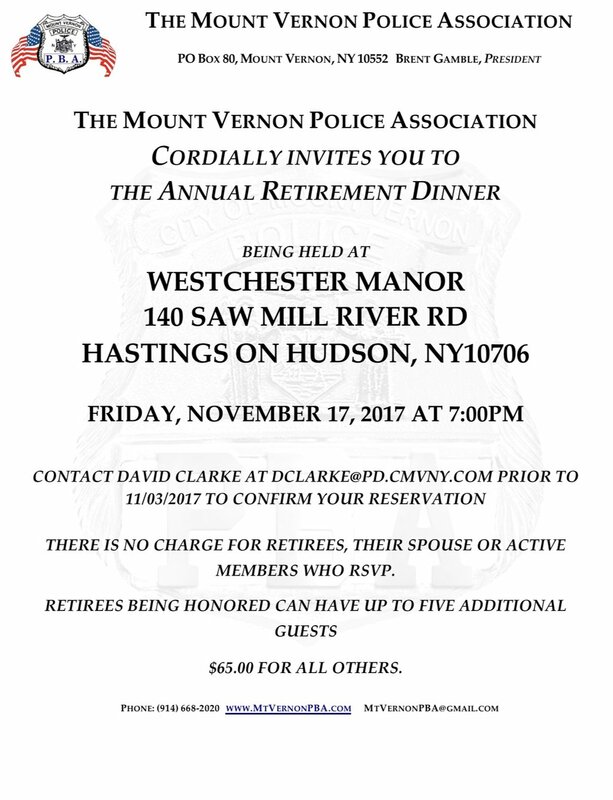 The Annual Retirement Dinner will be held November 17th at 1900 hours at Westchester Manor in Hastings. Please contact David Clarke at dclarke@pd.cmvny.com for further information. On Thursday, July 26th, the City of Mount Vernon held a promotional ceremony for the promotion of three sergeants, the designation of three detectives and the swearing in of twelve probationary police officers. We congratulate all those recognized on this special day!! Community Canvass for a Crime Prevention by Environmental Design class. We were honored today to have received recognition from the Mount Vernon Seventh Day Adventist Church for protecting our community using Community Policing Principles. Thank you for the recognition!!! Saying goodbye to a Legend. Ramon 'Ray' Rosado, we're gonna miss you. Congratulations on your retirement. 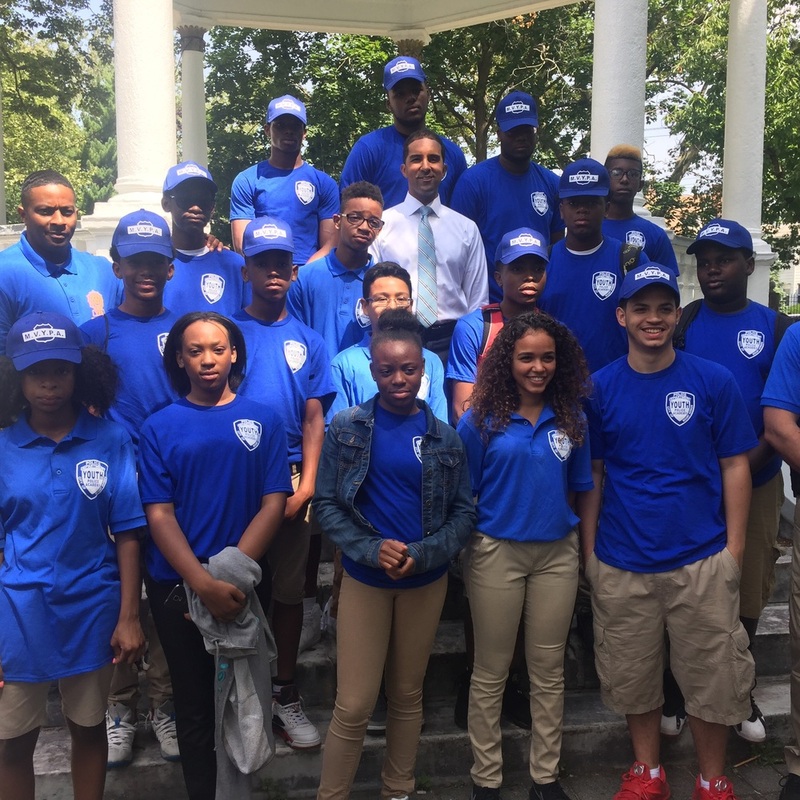 The Training Unit of the Mount Vernon Police Department has been hosting a Youth Police Academy for young teenagers from our community. 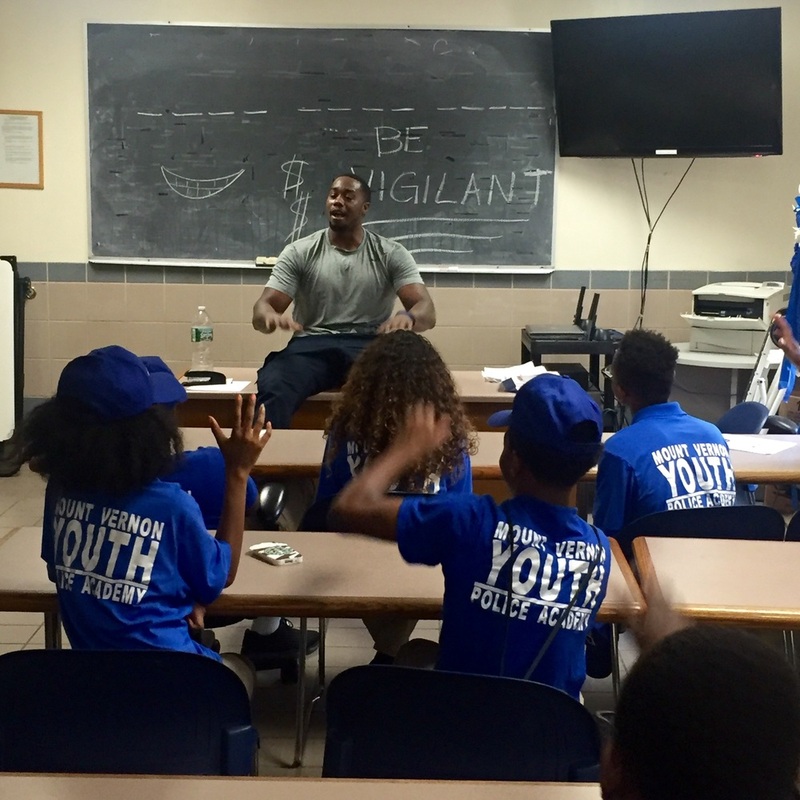 The Trainees have had instruction from multiple Members of the Department, along with Judges of the City Court, ADA's from the Westchester DA's Office and Administration from both the Department and City Hall. This program is one of many that the city of Mount Vernon utilizes to help us in building community relationships. The Association is fully committed to helping the Department to fulfill this goal.